Just as promised here is my post about Serbia (and also a little bit about my last couple of days in Bosnia and Herzegowina and Croatia) a country that has grown close to me over the past few weeks (my original "plan" was to stay in Serbia only for a couple of days). Serbia is neither one of the richest nor one of the most beautiful countries I have ever been to, it's people however are both rich in character and beautiful on the inside AND on the outside (a fact that was generally accepted among other travellers I met in Serbia). After I crossed the border from Osijek, Crotia into Serbia I made my way to Novi Sad which is a small and beautiful city near Belgrade. The next day I went into Belgrade to meet my warmshowers host Niki. My plan was to stay in in Pancevo (a small town near Belgrade) for just one night, but then I met other travellers, friends of Niki, Dusan (Nikis father) and so I decided to stay a couple of days more. A couple of days quickly turned into two weeks and after those two weeks it was hard to leave Pancevo behind. The main reason why I chose to leave when I did was because I wanted to keep Pancevo in good memory and that is why I left before I had a change to get bored. During my time in Pancevo I made a couple of day trips to Belgrade and the surrounding areas, watched a couple of Euro 2012 games and made many new friends of whom especially Tina and Dragan became like a second family in just a couple of days. They both are German speaking Serbs (at least according to their passports, I considered them more German than anything else). We spent almost every afternoon and evening together in Cafes or Bars and through them I learned a lot about the people living in ex-Jugoslavia. I have already made promises to many people that I am going to return to Pancevo when I am back in Europe and I intend to keep those promises. On my last day in Pancevo I met Neil, another round-the-world cyclist and invited him to stay with my host Dusan and me (Dusan of course was more than happy to have another guest in his house). 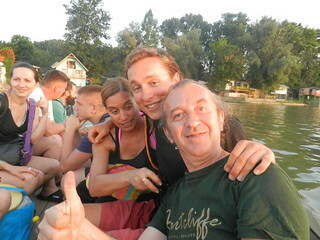 The next day, after saying goodbye to my new friends, Neil and me went on our way towards Jagodina. We decided to ride together until our ways part and so we ended up spending three days riding together. He's a funny guy and although our style of travel differs a lot, both of us had a good time. During my stay in Serbia and Bosnia and Herzegowina I also met some short-distance travellers from Poland with whom I travelled for two days and I got invited by many locals to join them for food, drinks and sometimes even to sleep in their houses or in their yard. From all the countries I have travelled in Europe (and by now I have been to most of them) I have never experienced such hospitality as I did in the Balkan. I'm in love with the whole area and it might be a good place to settle down some day. Unfortunately the town was full of boring mainstream tourists, houses that were converted to apartments for the season and locals who were trying to make money off the foreign cash-cows. I didn't stay for long and left just about an hour later. I can't stand touristy crowds like that, especially after I spent a week on quiet mountain roads in Bosnia and Herzegowina (one of the most beautiful countries I have ever been to). To me it felt like Dubrovnik (just like so many other cities that fell victim to mass tourism like so many cities in Northern Italy) is on the brink of destruction by mass tourism. If I ever go back there, I will do so early in the morning at around 5am and maybe then I get to enjoy a city that is incredibly beautiful and full of history and culture. Over the last couple of days I had to start thinking about where to go in the next couple of months. In just about 5 weeks from now, my brother is going to join me on my ride through Turkey and Iran (and maybe Georgia and Armenia) and maybe some of my friends from school will also join me for a while. The main reason why I have to start planning a bit more is because I will travel to countries that require visas that are not always easy to acquire (Iran comes to mind) and also because I have to plan on where and how I want to spend the winter. I am even considering going along the silk road through Kazakhstan, Uzbekistan, Turkmenistan and Kirghiztan into China (like I usually planned) and to ignore the fact that is is going to be -20 to -30 degrees. The alternative would be to take a ferry from Iran to the Arabic peninsula, spend one or two months there and then to take a ferry from Oman to India.